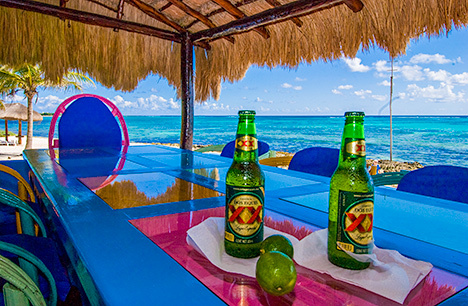 Oceanfront palapa patio has plenty of space for dinner or drinks! BR #6: Second level, 1 King, jungle view, private bath across hall. • Cook service includes; you pay for groceries. • NOTE: Refundable security deposit due upon check-in: $250 for 3 BRs, $500 for 4-6 BRs. 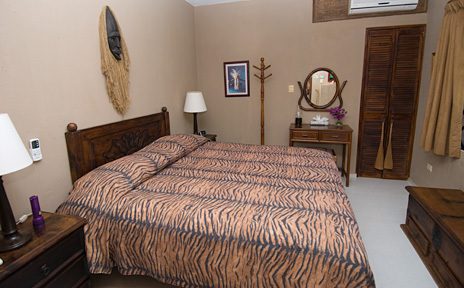 • Base rate is 2 guests per bedroom; for additional guests, add $200/wk. per person. • Holiday rate is based on 12 guests; add $200/wk. per person for additional guests; max. 14. 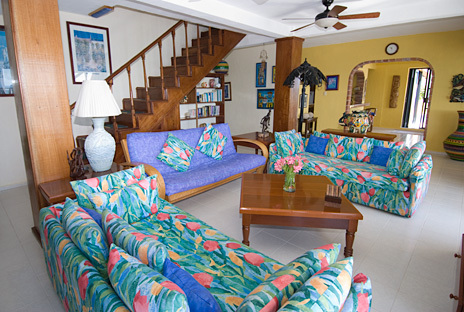 • Guests renting 4-5 BRs select BRs they wish to use upon arrival; the others are locked off. More about Casa Caribeña . . . 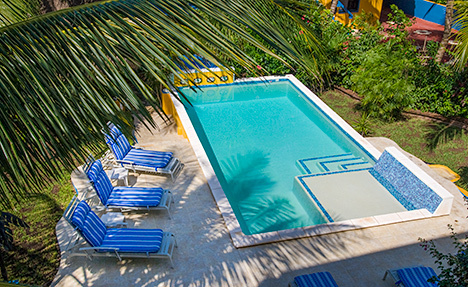 NOTE: For most of the year Casa Caribeña is offered as a 4, 5 or 6 bedroom villa which includes the second floor and rooftop entertainment area. 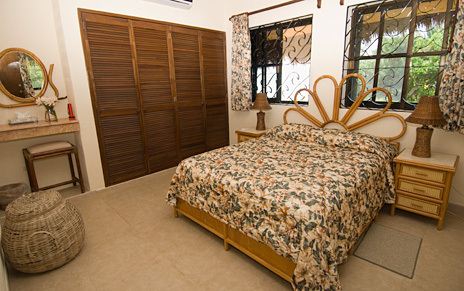 Clients renting 4-5 bedrooms choose their bedrooms upon arrival and the others are locked off. 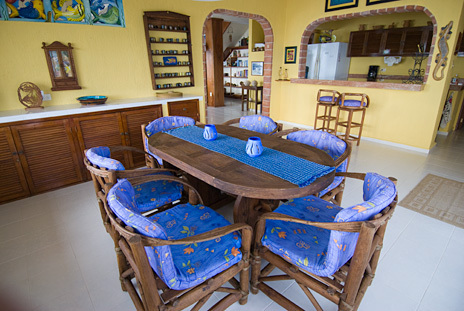 Part of the year, the owners occupy the second floor; at that time, Casa Caribeña is available as a 3 BR (mainfloor). 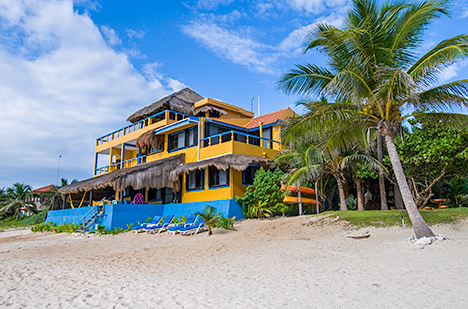 Casa Caribeña is a beautiful beachfront villa on a sandy white beach with a wonderful pool and fantastic palapa (thatched roof) patio for incredible outdoor living! With it's Rooftop Dipping Pool, you can see the entire bay. This is the place to be!!! 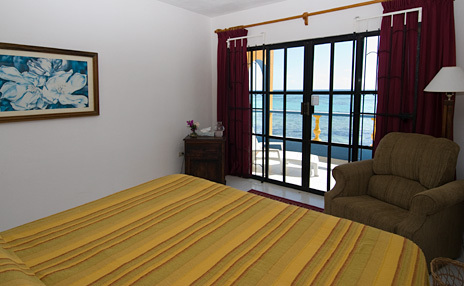 Casa Caribeña, located on Tankah Bay (south of Akumal and 10 minutes from Tulum), can be rented as a 3 to 6 BR villa. 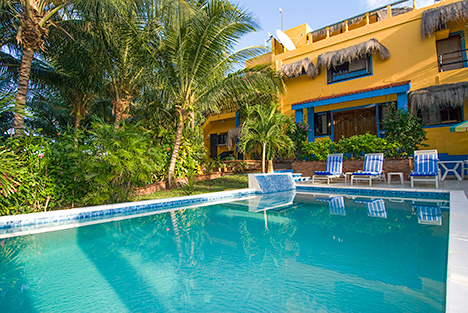 This property features a large swimming pool, a secluded white sand beach, fantastic palapa (thatched roof) patio, plus a rooftop dipping pool where you can view the entire bay. 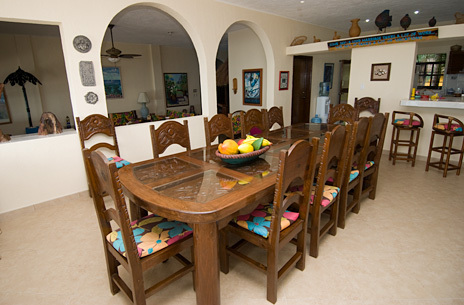 If you are looking for peace and quiet in a beautiful location with all the comforts of home, the Casa Caribeña fulfills your needs. This spacious property has approximately 2,600 square feet of living area on EACH level plus multiple outdoor living spaces as well. 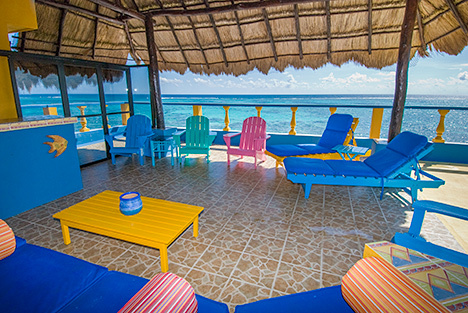 Located directly on a sandy beach, you can relax in the hammocks or lounge under the shade of the large palapa (thatched roof) and enjoy the gentle sea breezes. 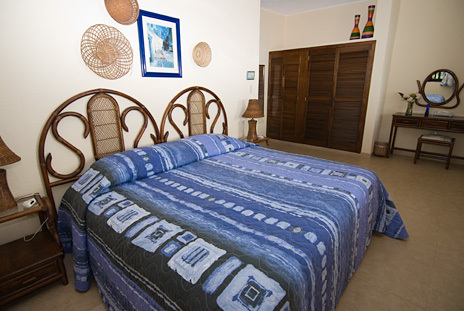 Interior of the Caribeña is exceptional with light and airy rooms tastefully decorated and fully equipped for your vacation stay. There is a living area on both the main level and the second level. Main level living room has U.S. Dish Network Satellite TV and CD stereo, 3 sofas, coffee tables and sliding glass door to the beach side patio. 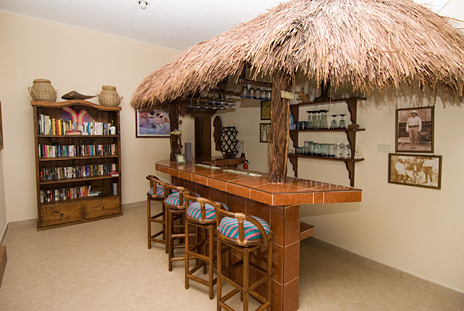 And, isn't it convenient for entertaining that the Tiki wet bar is just off the living room is midway between the beach and the swimming pool! A second living room on the upper level also has 3 sofas and TV with American satellite programming. Adjacent to this living area is a game room with aview of the entire bay; here you can play cards, work on a puzzle or enjoy a morning cup of coffee. 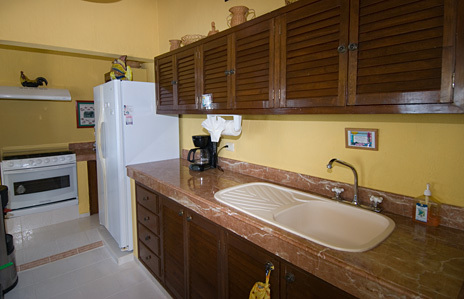 There is also a full bar on the second level, a full size refrigerator, stove and set of utensils. 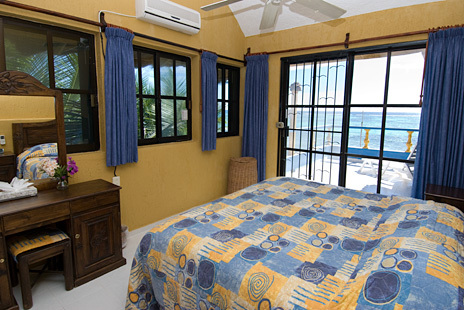 On the first level are 3 bedrooms: 1) Master bedroom with ocean views, a king size and queen size bed, private bath; 2) Second bedroom, ocean view with a king size bed, private bath; 3) Third bedroom has an ocean view, queen size bed and a bath is just a few steps down the hall. On the second level are 3 additional bedrooms: 4) Fourth bedroom, ocean view with a king size bed and private terrace and bath; 5) Fifth bedroom, ocean view, king size bed and private terrace and bath; 6) Sixth bedroom, jungle view, king size bed and bathroom is just across the hall. 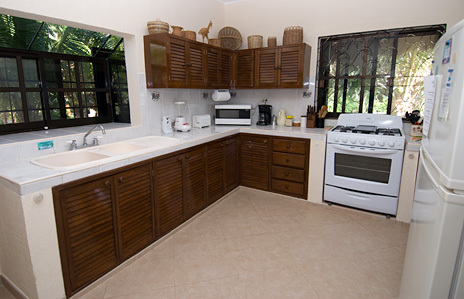 The huge kitchen has all that you need to cook what ever you like but we suggest you use our exquisite cook, Lily. Her talents are included at no additional cost; you just purchase the groceries. 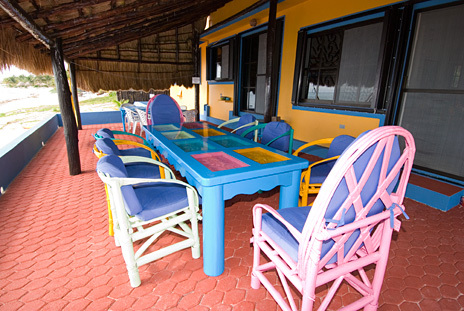 The dining room seats 14 people very comfortably, or enjoy your meals on the patio directly in front of the turquoise blue waters of the Caribbean. 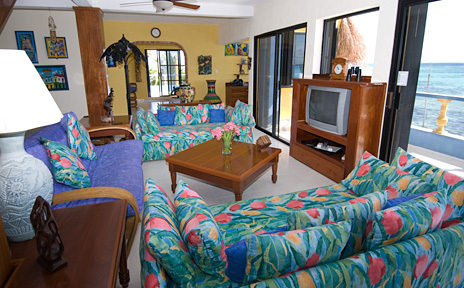 Sliding glass doors from the dining room and living room open to the spacious outdoor patio with palapa-covered roof. You can use the grill on this patio to cook up some tasty chicken, fish or burgers. 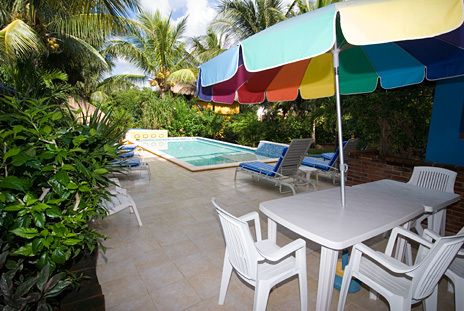 Between the patio and sandy beach are lounge chairs and hammocks for your leisure. 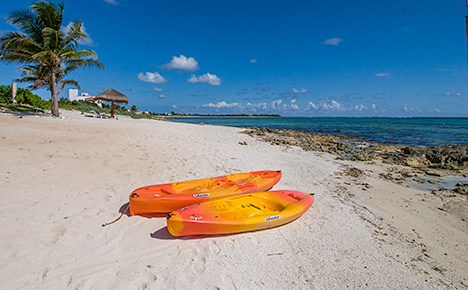 Sea kayaks are provided and are a great way to explore the coast. The rooftop is spectacular with a personal dipping pool that can seat 12 people. The views are incredible both day and night. 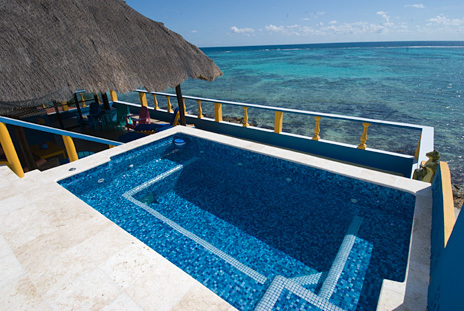 And, Casa Caribeña is the ONLY villa on the bay with a rooftop dipping pool. In addition, you'll find outdoor seating to enjoy a Margarita while you take in the views of the sunset, the beach, the stars and beyond. In the garden courtyard is a large 13x26 swimming pool, complete with a special platform just below the water's surface so you can keep cool while you soak up the sun. Ample lounge chairs are provided on the pool patio and a poolside palapa features numerous hammocks for perfect afternoon siestas. • An excellent cook can prepare your breakfast and dinner each day upon request at a reasonable rate. You will be delighted with the wonderful meals that Lily will provide. If you choose to go out, there are two restaurants within walking distance and many, many others within 10 minutes. 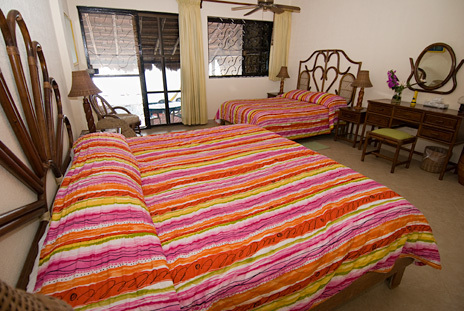 • Onsite is a Mayan Shaman that gives wonderful healing massages along with relaxing massages. 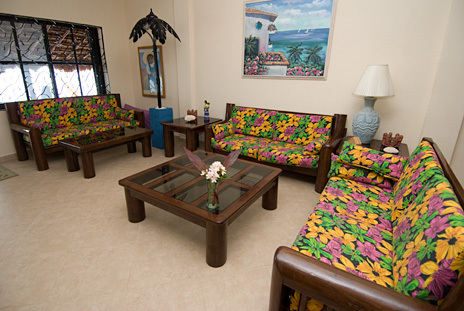 • A girl comes each week to give you manicures, pedicures, and facials while you lounge around the pool, under the palapa patio or up on the roof. 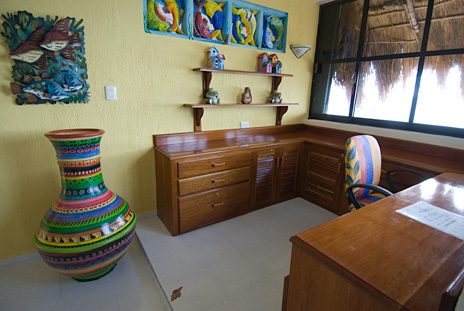 All of these services come to you while at Casa Caribeña at very reasonable additional costs. You don't have to go anywhere. There is scuba diving in the area with a dive shop near the villa. 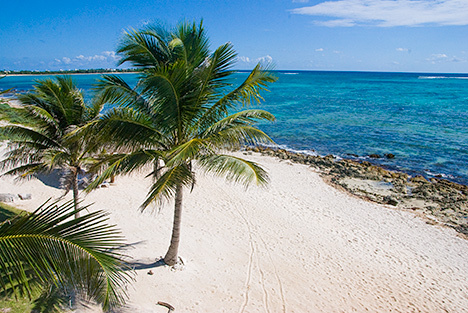 You can also enjoy excursions to Mayan ruins of Chichen Itza, Tulum and Coba. Or explore the jungles where you'll find caves with dramatic formations. Other activities along the coast include fishing, horseback riding, sailing and much, much more. A few steps down the beach is the famous Manatee cenote, an emerald green fresh water sink hole with crystal clear water for excellent snorkeling (at times, manatees have been sited). 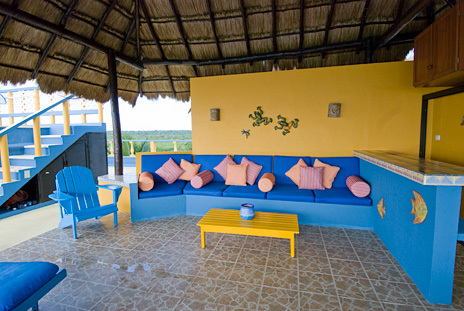 At Casa Caribeña, you have the beautiful Caribbean in front of you with the cool fresh water cenote in back of you. What a place to be! Computer work station on second floor; bring your laptop!